This is the last time Works For Me Wednesday will be linked to the original site, Rocks In My Dryer, so please head over there and check it out. So, I made them go into my bedroom and shut the door, while I thought about 3 Centers I could set up for them to do. (Centers have to be a surprise.) I’m a former elementary school teacher and currently teach 3-year olds at my Church’s co-op. Without a doubt, all my students (past & present) favorite part of the day is Centers, when they get a chance to go to a particular location, sit down with a particular task, and work on their own. So, I took a quick look around the house and thought about skills I’d like them to work on. When I’m setting up Centers, I usually try to have something art related, something solely for pretending, and something skills (cutting, gluing, counting, sorting, etc.) related. Of course, most of the time a Center will encompass several of those. I quickly spent about 5 minutes setting up a few things in different rooms. In my 2-year old’s room, I created a Bear Center. It had little colored bears that my youngest daughter likes to sort & my oldest likes to make patterns out of, and it had 2 little bear activities for them to dress bears in different clothes. One was magnetic and one had stuffed bears. In my 5-year old’s room, I set up a Cutting Center. In here, they were going to practice using scissors & glue sticks by finding things in a magazine they liked, cutting them out, and gluing the things onto a piece of paper (simple, I know but they love it.). In addition to helping them learn to cut better, it also helps me learn more about them, because I always ask them questions about what they cut out. Finally, a corner of our family room became the Kitchen Center. I put 2 play kitchens in that corner, brought out a little table & chairs, and set some paper & pens on the table. This center was designed for them to pretend. They could pretend to be cooks, waitresses, or even customers. Once the centers were set up, I went into my bedroom and asked them to decided together which room they wanted to go to out to the 3 rooms. I do not tell them what’s in the rooms, and they aren’t allowed to look. The surprise is half the fun. They chose Emily’s room, which had the bears. So, I led them to that Center & explained to them what was in there, and why. One of the best things about Centers is that it is an on-your-own activity. Mommy & Daddy are not involved at all. So, after I showed them the bears, I headed to the kitchen to work on dinner. After about 10 – 15 minutes I will go in and tell them it’s time to switch. They were having so much fun in the Bear Center, they asked to play for another 5 minutes. It is so worth the five minutes of preparation to get my two girls to play together & learn for forty-five minutes, all by themselves. We didn’t turn the TV on all night. Here’s another post I did on Centers if you’re interested. Visit the new home of Works For Me Wednesday, We Are THAT Family. Are the holiday cards stacking up at your house like they are at mine? Here are a few fun activities to do with them after the holidays. Cut the backs off of the cards and then cut the front of the cards in half (either horizontally or vertically.) Now you have a fun matching game for your child. I do this with a bunch and then put them in two piles and have my 2 year old find the matches. For older kids, cut the front of the cards (or let them cut their own) into puzzle pieces and have them put the “puzzle” back together. They can glue the pieces together on a separate piece of paper to make their own card or reuse the pieces over and over again. 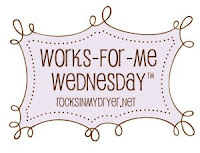 Go over to Rocks in My Dryer for more Works For Me Wednesday for more great ideas.